When Japanese auteur Kiyoshi Kurosawa (Cure, Pulse, Tôkyô Sonanta) received an offer to make two films in two weeks, on a low budget and using the same cast, the result was the cinematic equivalent of fraternal twins. 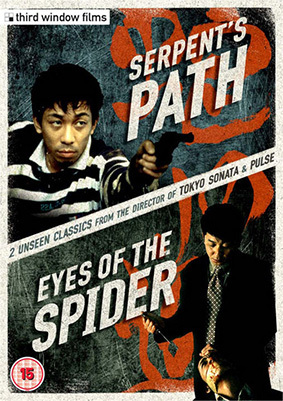 Though both Serpent's Path [Hebi no michi] and Eyes of the Spider [Kumo no hitomi] are gangster films about the desire for revenge and both films feature a protagonist named Nijima, played convincingly by Sho Aikawa, the two films are completely different in tone and plot. Serpent's Path and Eyes of the Spider will be released on DVD in a single package on 9th September 2013 by Third Window Films at the RRP of £14.99. No extra features have been listed, but you're getting two rarely seen films by one of modern Japanese cinema's most singular talents for the price of one, so we're not complaining.